PartnerShip® is always working to expand our available carrier network in order to meet every customer's shipping needs, every time. For those customers who value premium service and an unmatched experience, we are pleased to announce the addition of the ArcBest® network to our comprehensive group of partner carriers. With an extensive transportation solution network, ArcBest offers superior less-than-truckload (LTL) service through ABF Freight® as well as specialized time-sensitive alternatives through Panther Premium Logistics®. These additions help elevate available logistics options for PartnerShip customers. ArcBest offers a variety of stand-out services that benefit customers with specialized or unique needs. 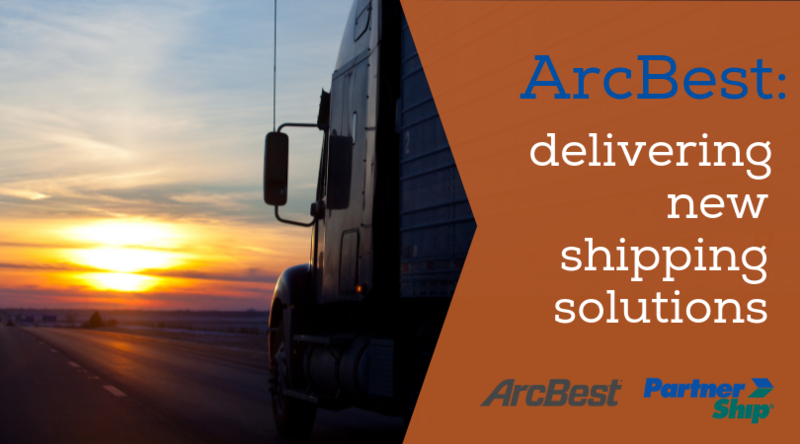 In addition to a full-service network of transportation options such as intermodal, supply chain services, international shipping, warehousing, and distribution services, ArcBest also provides premium time-critical and event shipping solutions. In addition to these options, the ArcBest company umbrella of carriers brings even more unique benefits for shippers. A standard 53-foot enclosed trailer, or dry van, is the most common truck type used to move freight. The height of the trailer is 8.5 to 9.5 feet. There isn't much differentiation between trucks aside from the door type, which can either swing open or roll up. This is a sizable truck, and not every pick-up or delivery location is equipped for proper vehicle maneuverability. This presents challenges for loading and unloading. ABF Freight, a premier ArcBest freight carrier, commonly utilizes shorter pup-trailers, not 53' vans. A pup-trailer measures between 26 and 29 feet in length. Due to this smaller size, congested access points such as a busy side street or challenging dock configuration, like a school, can be more easily navigated. Most common carriers are very specific about what they will move for shippers, and what they will refuse. Odd, over-sized items and easily-breakable commodities are determined risky for freight carriers, and shippers are usually refused pick-up, often at the discretion of the local terminal. Carrier Rules Tariffs are frequently being updated as capacity continues to crunch, allowing common carriers to become more selective about what types of products they choose to move. Items such as flag poles, furniture, and other challenging density-based commodities are accepted by ArcBest carriers, making them an excellent option for shippers who may have a challenging freight move. Another special service that ArcBest offers for shippers is terminal-direct scheduling and available contact information. If you've ever had to schedule your own pick-up, or tried to contact specific terminals to check on freight, you know that carrier websites are almost never transparent. Most often, you will need to go through an automated number and exhausting phone tree in order to access a service representative. Some carriers don't allow shippers to connect to specific terminals at all. This can be frustrating when time is compromised and your shipment is being delayed. Speaking to a particular terminal allows for better tracking, accountability, and clarification for customers. ArcBest, in particular ABF Freight, makes this a critical option for shippers. The added ability to expedite ground LTL shipments while already in transit is a service now available to PartnerShip customers through Panther Premium Logistics. Panther, an expedited carrier option under the ArcBest umbrella, is a convenient choice for customer's time-critical shipments. With a variety of truck equipment options, from sprinter vans to flatbeds, Panther offers premium logistics solutions for those who may have unique shipping requirements. If the deadline for your shipment delivery is sooner than you anticipated, Panther has the ability to bump up your service from standard ground LTL to expedited delivery while in transit. The carrier network extends nationwide, providing reliable transportation that fit both regional and long-haul markets. In line with providing premium shipping and handling services, ABF Freight also boasts one of the lowest LTL claims rates in the industry. ABF Freight prioritizes meeting customer pick-ups, making sure your shipment gets moving when it needs to so you meet your deadlines. We know that every shipper has individual needs for their business and their shipping. By adding another carrier we are able to extend available service options for customers - helping to broaden our network and meet those needs. If you'd like to learn more about ArcBest shipping options, contact us and we'll help determine which solutions are right for you.